You don’t need a table to explore Chef Bruce Wieszala’s penchant for locally sourced food at Tabree (4610 Main St., Snyder). Tabree offers a charcuterie platter in two sizes ($30, $16) populated with a sampling of cured meats that Wieszala has made in classic Italian salumi style, using pork raised in Lockport. It’s especially popular with customers looking to sit at the bar and have a bite with drinks, Wieszala said. There’s cured sausages and meats, a pork terrine and pâté brûlée, liver spread made from those Lockport pigs or chickens from Alden, covered with a crackling caramel coat. 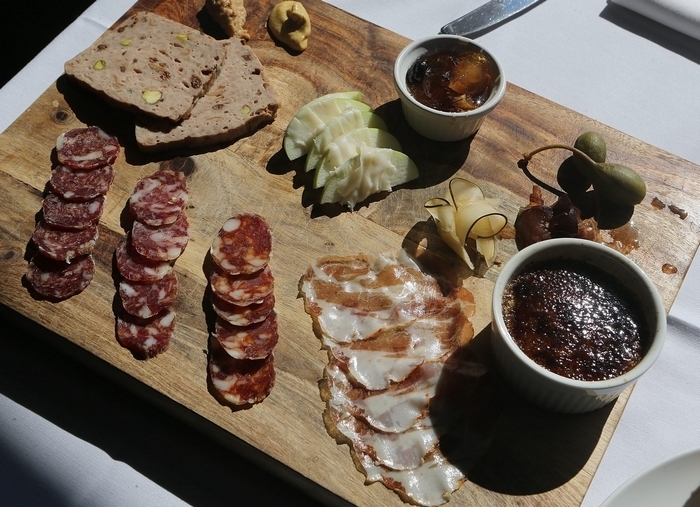 The charcuterie board’s selection varies, depending on what’s ready to serve, the chef said, but you’ll get to sample six to eight varieties. Here’s some of the salumi you might encounter. Finocchiona is a Tuscan sausage flavored with fennel seeds. Sopressata is a traditional Italian salumi powered with black pepper and garlic. Chorizo is a Spanish-style cured sausage, flavored with a blend of spicy, smoky and sweet paprika. Then there’s the other meats. Capocollo is made from the neck muscle of the pig. Lardo, cured back fat, is served in paper-thin sheets wrapped around apple slices. Pork terrine with pistachios is made from ground pork. “I’ve heard it described as fancy Spam, which is a pretty good description,” Wieszala said. It all starts with a pig from Lockport’s T-Meadow Farm. Butchered and cleaned, the animal, ranging from 220-280 pounds, arrives halved or quartered. Wieszala and sous chef Dustin Murphy do the rest, cutting and grinding the meat, adding spices, and starting fermenting and curing processes that can take from a month to a year, depending on the salumi. After honing his touch with meat, salt, spices and time over years of work, Wieszala’s handmade salumi are drawing their own crowd. “People have been showing up, hanging out at the bar and ordering a board and some drinks,” he said. Lager for the Lakes. 6 p.m. Monday in Pearl Street Grill & Brewery (76 Pearl St.). Enjoy food and a beer tasting to benefit the Great Lakes Experience Institute, dedicated to “conserving, enhancing and enjoying” lakes Erie and Ontario. Cost is $10.